Del Val Controls can bring to your company’s location an educational tabletop display, which shows the vast array of product solutions that we can offer for your process automation and instrumentation needs. Quite simply, this is a trade show that we bring to your location that gives your team an introduction to products that may in fact solve some of your pressing application needs and requirements. 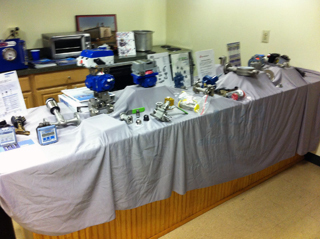 Our tabletop presentations can focus on clean process, dirty process, or instrumentation. Thanks for the presentation! It was very nice of you to involve all of our shop guys. Our Maintenance Superintendent, Mike Hopkins, said " I had no idea DelVal's line was so vast."